The Federal Aviation Administration is holding public workshops this week to get feedback from residents about proposed changes to some flights out of Reagan National Airport. 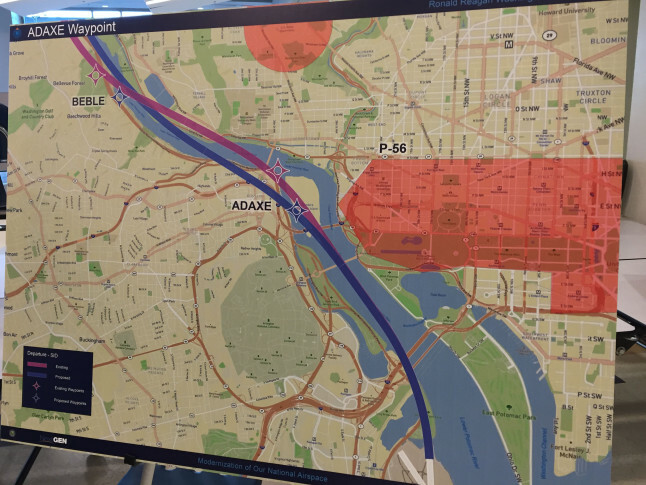 WASHINGTON — There are plans to tweak the northbound flight departure path out of Reagan National Airport to reduce noise, and the Federal Aviation Administration is holding public workshops this week to get feedback from residents. It was almost a year ago that the Reagan National Community Noise Working Group was formed to make recommendations to the FAA. Three possible alternative flight paths were considered, but the group voted in favor of alternative “B,” shown in maps at a Tuesday night workshop at Washington-Lee High School. The FAA hopes to finalize the plan soon. “What we’re shooting for is January for this change,” said Ray. The plan would move planes away from the Bellevue Forest neighborhood where Gail Kouril lives. “You can’t carry on a conversation in the backyard. You can’t do anything because every two minutes there’s a plane, or less,” Kouril said, speaking Tuesday night. Jill from Arlington, Virginia, who declined to give her last name, does not like the plan. “It will make it worse for us actually,” she said. Two more meetings will happen this week. Wednesday’s will take place at the Georgetown Neighborhood Library, and Thursday’s will be held at the Bethesda Chevy Chase Regional Services Center. Both events run from 5:30 to 8:30 p.m. Residents can also submit comments about the plan online.